That´s where we come from. Our DNA in racing. We want to continue proving who´s the best motorcycle racing team in Germany and the surrounding countries. Of course, we are still supporting upcoming racers and aim for the Superbike title. „I want the best bike“. Ilya´s first answer on the question, why he wanted to join Werner Daemen´s Team for the 2018 IDM Championship. The 21-year old Ukrainian surprised with a second place in the season finale of Superstock 1000 European Championship in Jerez 2017. He finished right behind Markus Reiterberger and claimed his first podium in this competitive field. Ilya had to face a new bike and most of the championship’s track’s were new to him. At the 2018 final race at Hockenheim, Ilya became the 2018 IDM Superbike Champion. In 2019 he will stay on board to try to defend his crown. SCHLEIZ. The home town of Julian in Thuringia/GER is well known for its racing passion. Schleiz hosts Germany´s oldest nature racetrack. No wonder – that Julian lives his motorracing dream. 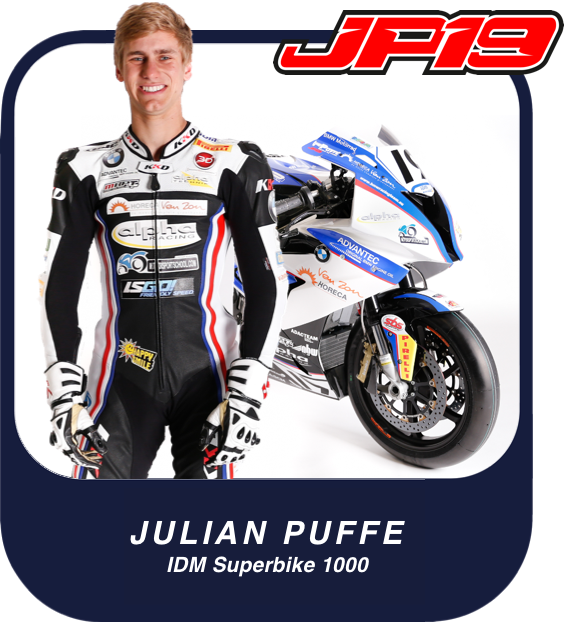 After several years in international Superstock championships, Puffe joined alpha Racing-Van-Zon-BMW in 2018 to storm to a 3rd place in the final standings, earning several podiums on his way. He stay’s on board for 2019, trying to get that elusive first IDM Superbike race win – and maybe even more.